I guess I should have known. It was, after all, a pirate-themed restaurant. You don't tell a pirate where to look...he'll just give you the bird. 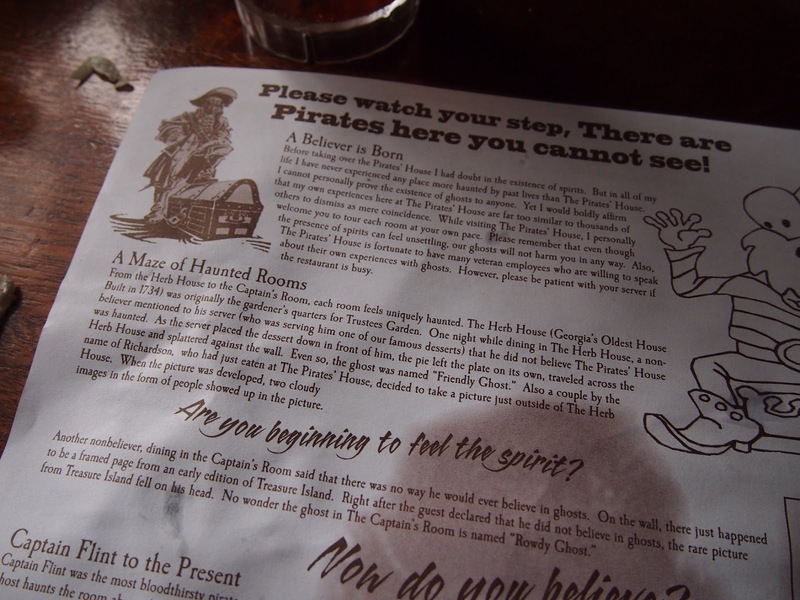 However, calling The Pirates’ House in Savannah, Georgia, “pirate-themed”—while completely accurate—does the place slight disservice. Because it is a legitimate pirate site. Built in 1753 as an inn, the house was a meeting spot for seafaring folk of a wide range of loyalties. These salts would come up the Savannah River for food, drink, bed, and havoc. Stories are told of dastardly plans hatched within its rooms, men drugged and shanghaied into service, torture and imprisonment in its bowels. You know, tales that no dead man tells. Of course, it’s the living you have to worry about when it comes to tales. The place has been a restaurant for like half a century and over the course of trying to pull in customers, the history of the place has gotten barnacled with fancy to the point that you can’t see the hull anymore. Plus there are the ghost stories. 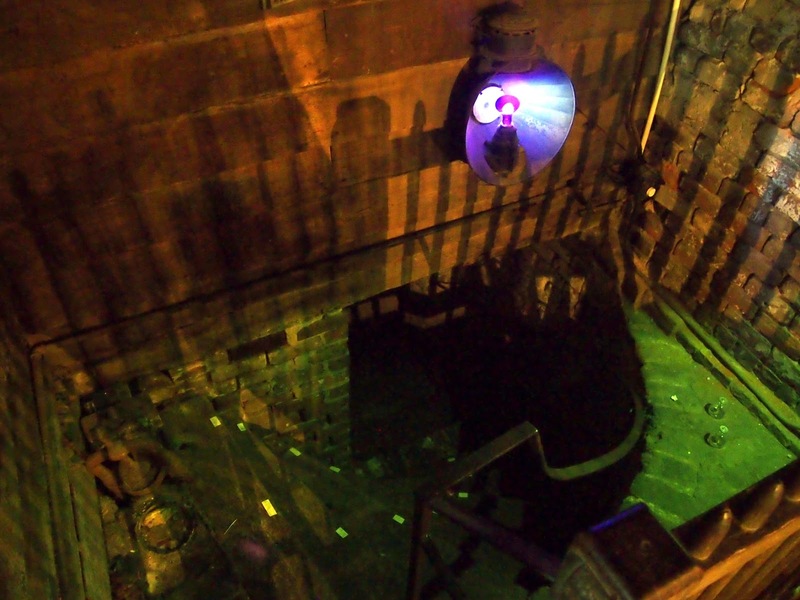 You can’t have pirate stories without pirate ghost stories (and vice versa). As a result, it’s deucedly difficult to figure out what’s true and what’s false about the building’s piratey past. One bit of clever marketing connects the site to Robert Louis Stevenson’s Treasure Island. In it, the demoniac Captain Flint is supposed to have died in Savannah in 1754, a death which is basically the catalyst for the entire treasure hunt that is the book. 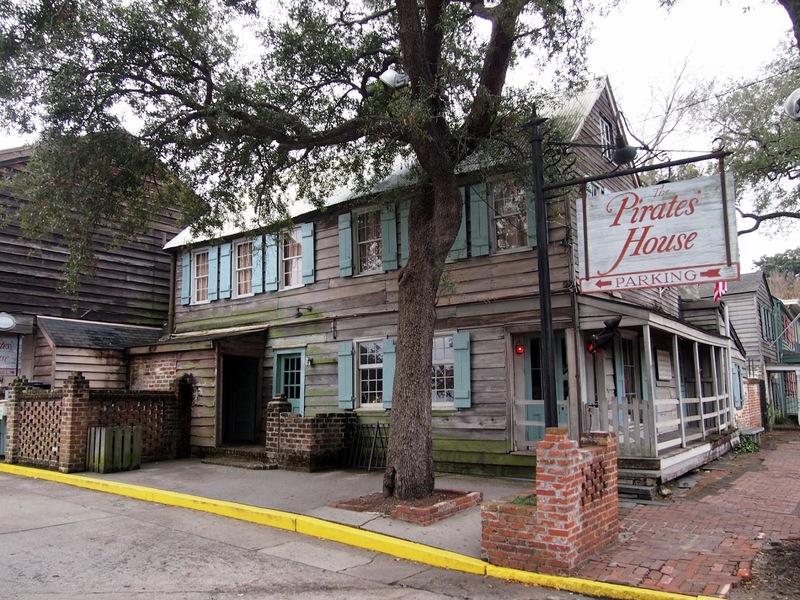 No real details are given in the book as to the place in Savannah of the fictional Flint’s death, but what’s now the Pirates’ House was there at the right place, at the right time, and did have the clientele. It’s also a good example of those barnacles. 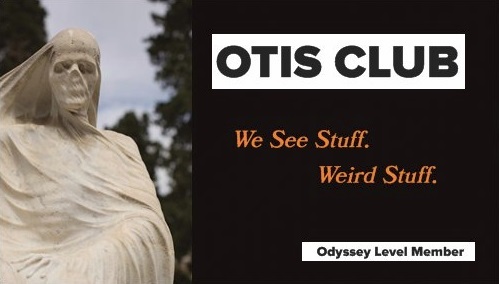 From this vague, but still interesting connection, the stories have spiraled into Flint being a real pirate whom Stevenson met there and/or who died upstairs in the house and/or whose ghost haunts the place. The paper placemat is covered with those kinds of tales to read in between ketchup stains. Located on 20 East Broad Street, just a block from the Savannah River. The Pirates’ House is covered in large wooden planks gray with age and weather. Inside, we were led through the warren of 15 or 20 dining rooms of various sizes that looked like they grew off each other randomly. 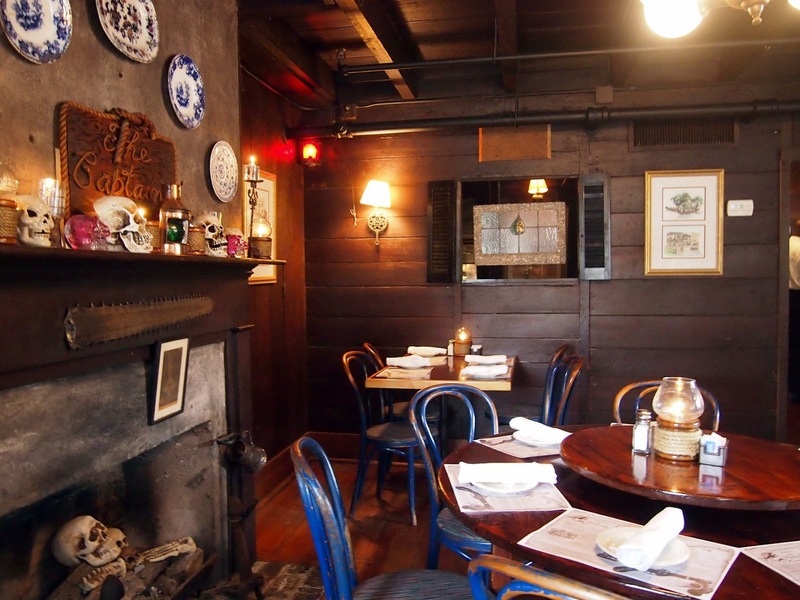 The place has great atmosphere, with fireplaces and exposed beams and, even with some of the cheesy pirate additions to the décor, you can really feel the age and easily imagine sailors tattooing themselves across the tables while breaking tankards of rum over each other’s heads. After putting in an order for she-crab soup and a rum-and-coke (because, pirates), and chatting a bit with the piratess, I wandered about the place. Every once in a while a wall placard labelled a feature and implied this or that unprovable history of it. 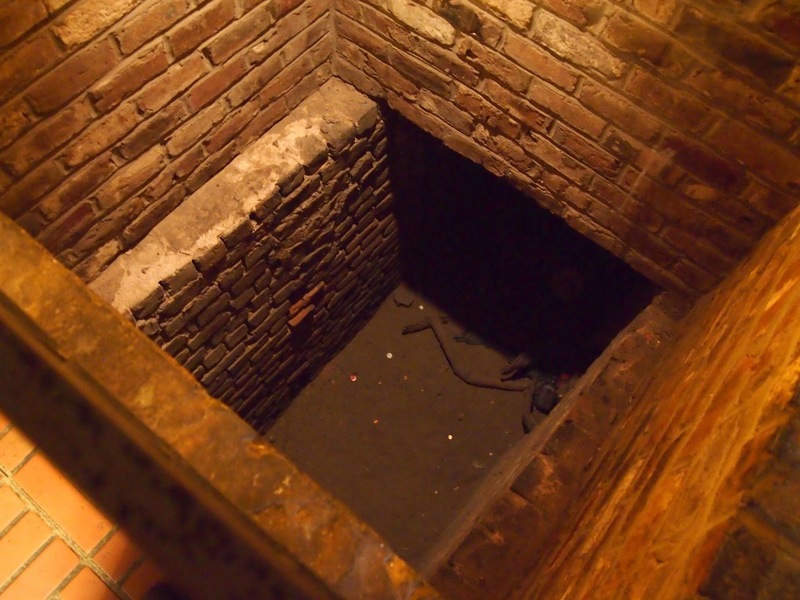 A deep, dirty, brick-lined hole in the corner of one room discovered during a renovation in 1962 was rumored to be the entrance to a secret tunnel or a place to hide treasure or a dungeon for holding hostages. Elsewhere a set of blocked-off curving stone steps leading down to a basement was suggested to be the beginning of another secret tunnel. On one wall were framed pages from an old edition of Treasure Island. Fake skulls were set on a mantelpiece above one of the fireplaces. 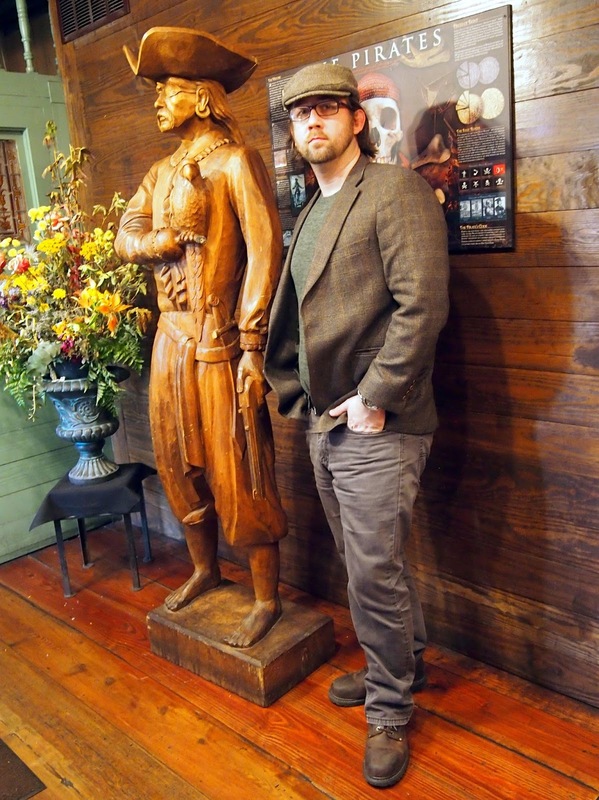 A wooden pirate statue stood guard at the servers’ counter. Upstairs was a gift shop. One wall in a hallway looked as if it had been the exterior of another building at one time. 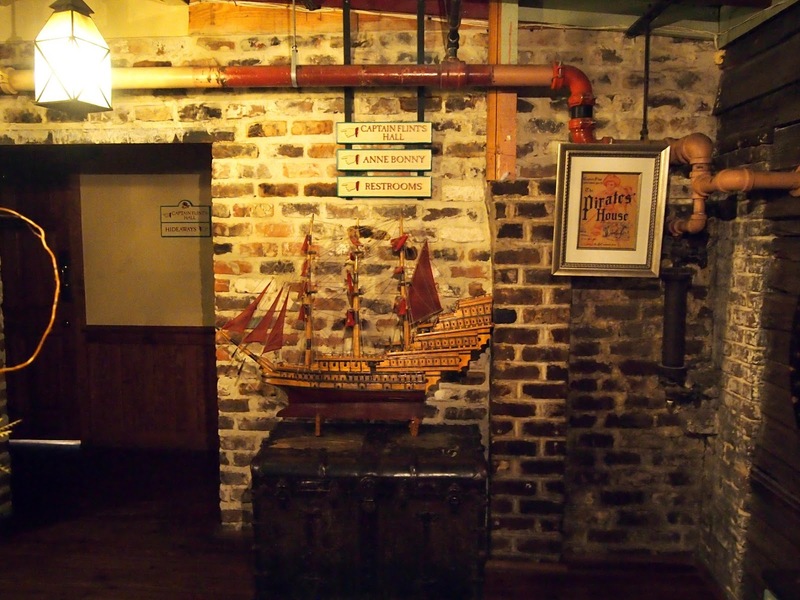 In fact, when it was built, the Pirates’ House had shanghaied an already existing building known as the “Herb House,” which had been part of an experimental garden to see what could grow in the alien soil during the original settlement. The Herb House was erected in 1734 and is believed to be the oldest building in Georgia. The Pirates’ House, he says, winding down the article without really knowing how to end it, is a weird mix of authentic and inauthentic. I don’t know if I wanted my experience to be more piratey or less piratey, but it’s a cool place. I only regret not walking out of there with one of the paper pirate hats they give to the kids.